For Pete's sake. I just burst an ovary. That is so stinkin' sweet - I can barely stand it! Awww. That is beyond cute. 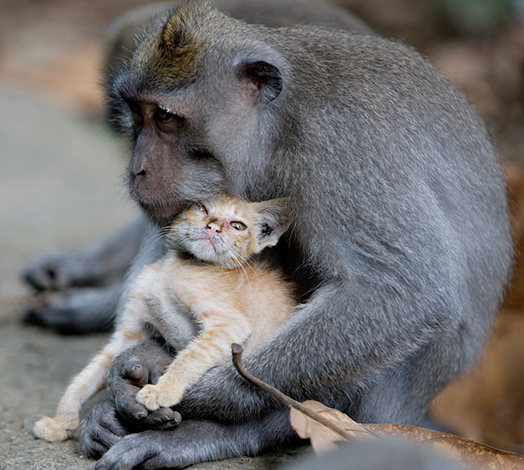 Although, maybe the monkey is planning to eat the kitten. i saw this on persephone's blog comments the other day. it's my new favorite thing (n.f.t.). i especially love this one: http://www.guardian.co.uk/environment/gallery/2010/aug/25/bali-animals#/?picture=366113726&index=2. i die just a little every time i look at it. i die of happiness. I also experienced some varied emotiions about this, though, because on the one hand TOO CUTE! and on the other hand DO MONKEYS EAT KITTENS? and on yet another hand THAT KITTEN IS NOT GOING TO MAKE IT. But i'm sticking with cute.